Today's Image of Mars is the latest HiRISE image taken in the search for the lost Soviet lander, Mars 6, which was expected to impact the Martian surface at 09:11:05 UT on 12 March 1974. Unfortunately contact with Mars 6 was lost just as it should have impacted the surface, however, data transmitted prior to communication failure indicated that the parachute successfully deployed. This gives scientists hope that they can find the lost lander by locating the bright white parachute, which has been the easiest thing to identify most of the past successful landing sites. 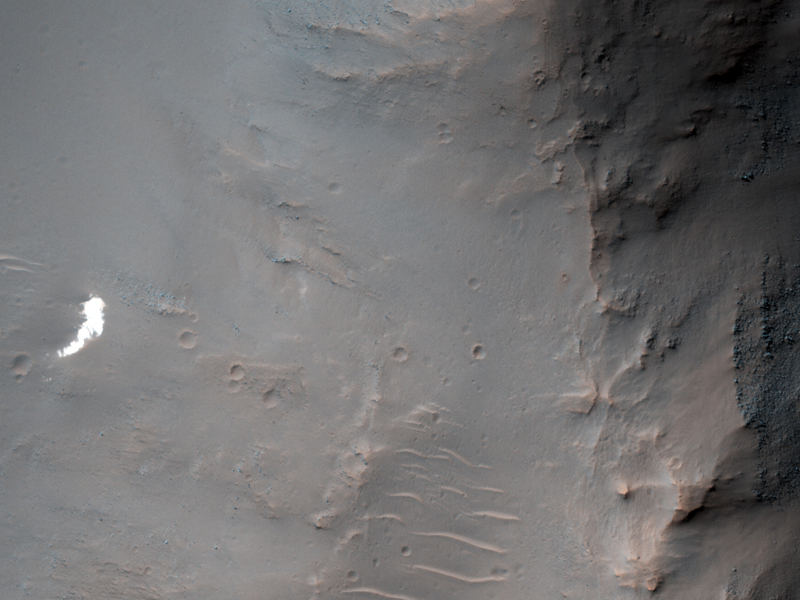 That's why this image was taken; the Mars Reconnaissance Orbiter's Context Camera (CTX) team saw a small white patch (right middle) and suggested the HiRISE team take a closer look. Upon examination by HiRISE, the team discovered that the white patch was just some relatively bright terrain. And so the search for all the lost Mars Landers will continue!